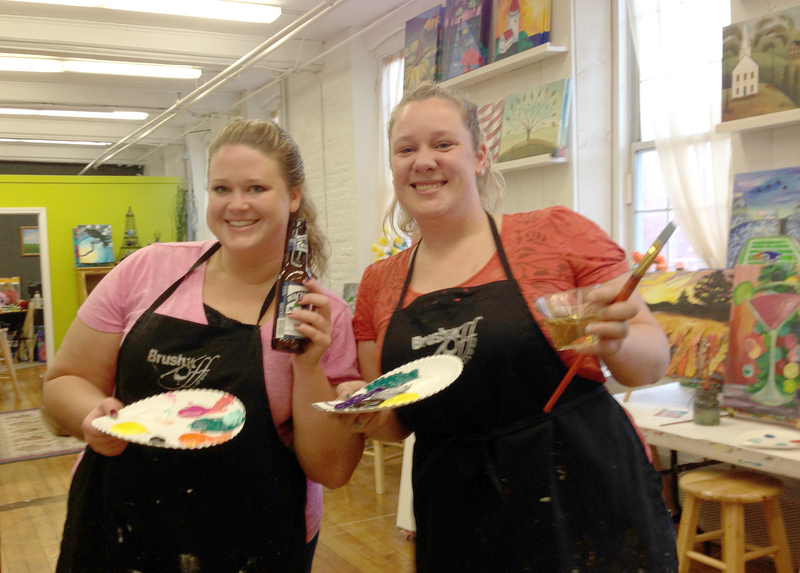 My cousin Cortney (right) and I, all ready for a fun afternoon of painting). Several months ago while out on a walk, I happened by the Brush it Off Paint and Sip Bar. Combining art and drinking? Sounds like my idea of a good time! Ever since I saw the bar, located in the Millyard Marketplace (559 Main Street, RT. 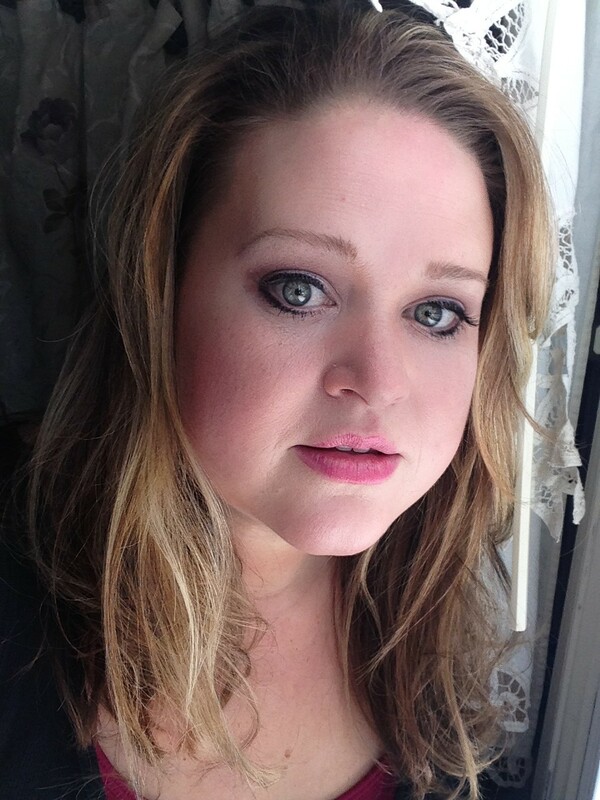 20, Sturbridge, MA), I have been talking to my mom about checking it out. Sunday, an impromptu visit from out-of-town relatives gave us the perfect excuse to give it a try. I was immediately impressed by the comfy feel of the shop as soon as I walked in. Dozens of paintings form previous classes (all of which are available for purchase if you want the art without having to do the work) covered the vibrantly painted walls. You pay for the class in advance (generally $25-30 per class). The fee includes the use of an apron and brushes, paint, a canvas and instruction. The cash bar features an array of wine and beer (I chose a Wachusett Blueberry Ale), in addition to snacks and non-alcoholic beverages. 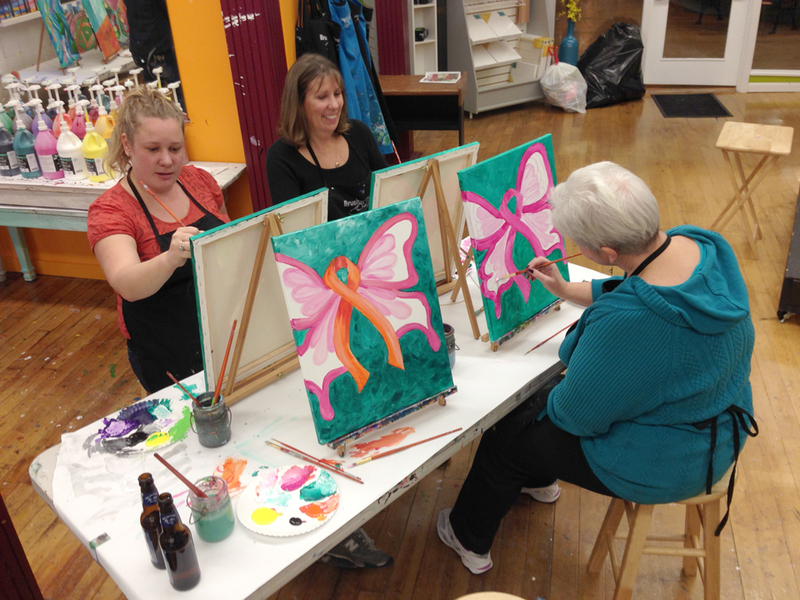 Everyone in the class paints the same painting, following step-by-step directions from the instructor. You can tell what paintings will be taught by going to the store’s website and looking at its calendar. We painted butterflies with bodies that looked like ribbons. While it is easier to use the same colors as the instructor, it isn’t mandatory, you can use whatever colors you chose. 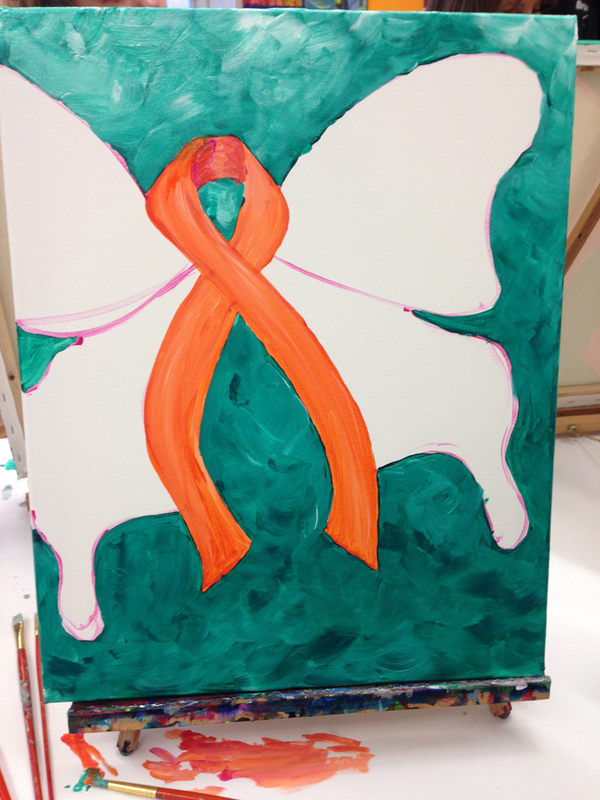 I chose to make the body of my butterfly orange, in memory of two friends I lost to cancer this year. 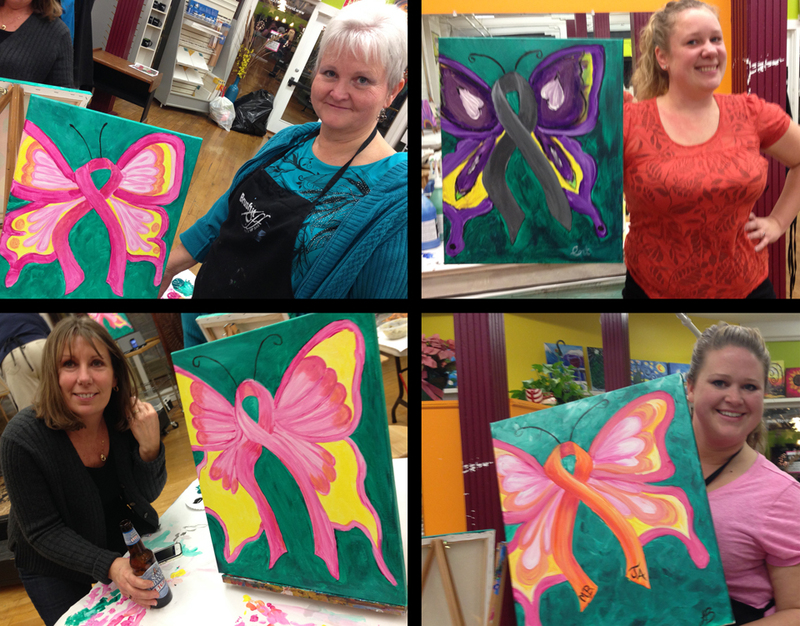 The painting class was a blast and the directions were easy to follow. Everyone was chatting while working on their masterpieces, some even singing to the music playing softly in the background. Our instructor, Denise Morgan (who also happens to be the owner of the establishment) was quick to put the class at ease, creating a fun and relaxed environment. Step-by-step she brought us through the process of creating our masterpieces, giving us plenty of time between instructions to put our own artistic twists on the art without feeling rushed. She also was wonderful about roaming around the room helping anyone whose paintings decided to fight back. By the end of our class we were all happy with our butterflies, and were all excited about making another trip back for more painting. This would be a perfect event to do for a birthday party, girls (or guys) night out, or just a different way to spend an afternoon. They are also available for fundraisers. Five dollars from everyone’s fee for our class was donated to the American Cancer Society. If you are a natural artist and aren’t interested in following the crowd, there are also open painting sessions available. If you are at all artistic (or want to learn to be) I HIGHLY recommend visiting this establishment. I’m already looking forward to my next trip. The final product. Clockwise from top left, my mom, cousin Cortney, me and cousin Peggy.